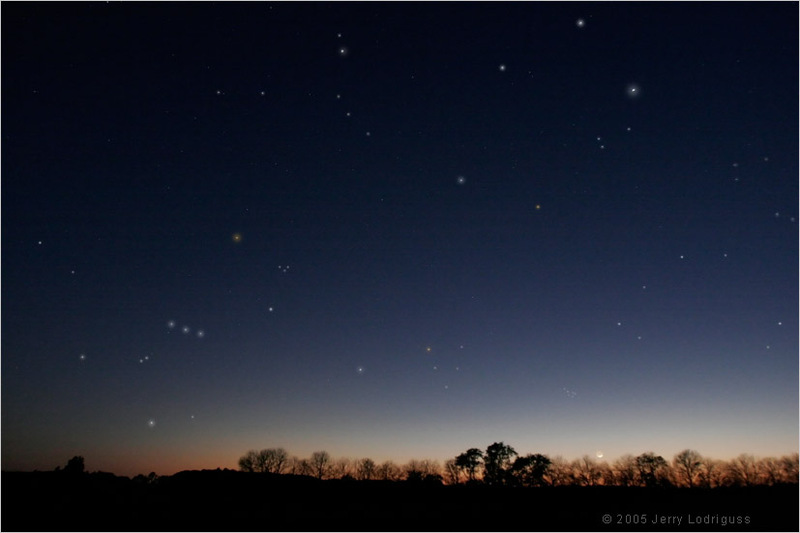 Explanation: This lovely twilight scene, recorded last April, finds a young crescent Moon low in the west at sunset. Above it, stars shine in the darkening sky but they too are soon to drop below the western horizon. These stars and constellations are prominent in the northern hemisphere winter sky and as the season changes, slowly give way to the stars of summer. Sliding your mouse over the picture will detail the constellations and stars in view, including Orion, Gemini, Auriga, Perseus, and the Hyades and Pleiades star clusters.